The food we choose to eat every day has a major impact on the planet. As a matter of fact, food and climate change are inextricably intertwined: global warming and changes in rainfall have a major impact on our food security, and in turn our diets represent a major source of greenhouse gas emissions in the atmosphere. In three decades, emissions related to agriculture and food production are likely to account for about half of the world’s available “carbon budget” – the amount of carbon dioxide emissions we can emit while still having a likely chance of limiting global temperature rise to 2 degrees Celsius above pre-industrial levels. While energy sector, transport and buildings have long been the main target for governments, businesses and campaigners looking to reduce emissions, the impact from food production has often been left out. But on current trends, with intensive agriculture dramatically increasing, food production will be a major concern. Although improved farming practices to reduce emission intensity have emerged in recent times, dietary patterns will need to change to avoid catastrophic consequences. 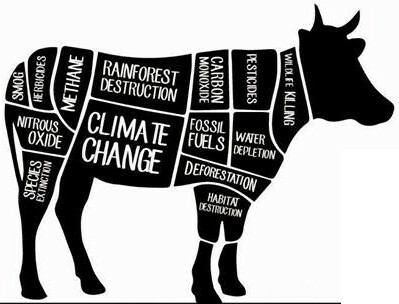 According to the latest research, led by scientists at the Oxford Martin School, shifting to a mostly vegetarian diet, or even simply cutting down meat consumption would curb greenhouse gases and bring down emissions by 63%. For example, ruminants (such as beef and lamb) dominate emissions from livestock and are high in unhealthy saturated fats: producing 1kg of beef requires 15,000 litres of water, 30kg of carbon dioxide or equivalent greenhouse gas emissions and 5m2 of land conversely, fruit and vegetables are relatively low in greenhouse gas emissions and provide significant health benefits. Producing 1kg of potatoes, for example, requires just 290 litres of water, 0.5kg of carbon dioxide emissions and 0.6m2 of land. Therefore, eating more fruit and vegetables but less beef and lamb is likely to be both healthier and more sustainable.